Sometimes you just have to have a little faith. Trust in yourself, in your idea, in the yarn. Leap a little, or a lot. Or maybe you just have to follow along wherever your ideas take you. It’s just yarn, just a pattern. You have to assume the best and remember that what you end up with isn’t going to change the world, just you. This Lagoon yarn is mine, to lead or to follow, as I choose. My hand is on every inch of it, many times over. I spun it, plied it, wound it into a little ball. It consumed me for days, and whispered to me whenever I passed. I get to decide what is to become of it, though I want to let it have a say. We have to agree, the yarn and me, but since I am the one who will do all the work, at some point the yarn has to let go and let me knit. It’s so watery. The deep liquid colors, the softness of the cashmere and silk fibers, the way the two plies wind around each other – everything flows. I wanted to knit something rippling, like water, but the scarf I began the other day just lay there. The ruffle was fine, but the rest was too flat. I went off to find something else. Lacy Riverine, maybe, but I didn’t have nearly enough yarn to do it, even with modifications. 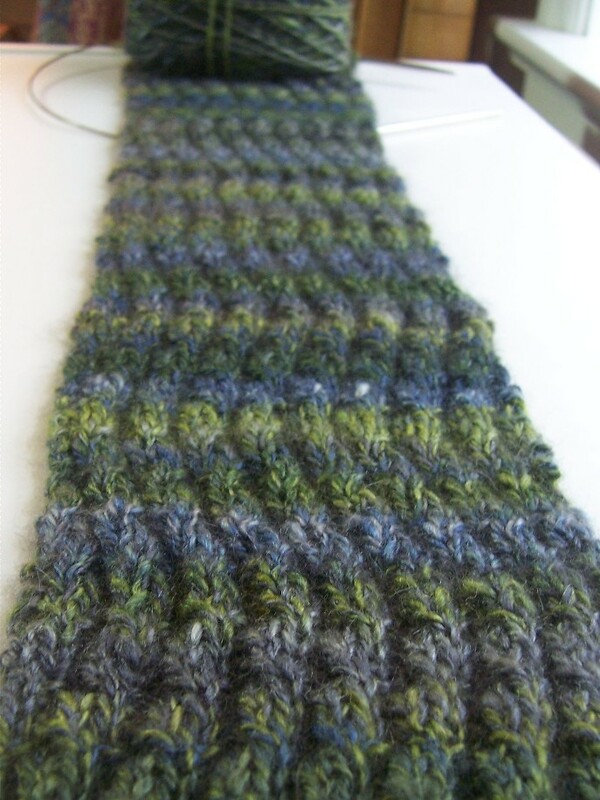 Then I found the link to this Rainy Day Scarf and had cast on almost before it finished printing. It’s not very wide (about 4.5 inches), something I debated until I thought about the scarves I wear most often — they’re long and narrow, wrapped around and around. The wavy rib is stretchy, and I might or might not block it. It looks so substantial in the photographs, but in the end it will weigh just two ounces, which was all the fiber I had to begin with. It even blew off the windowsill as I was taking pictures! Yarn: Handspun 2-ply cashmere/tussah roving from Blue Moon Fiber Arts, “Lagoon”; spun on my Ashford Traditional wheel. You never know, though. I might decide to take a detour at some point. That’s the thing about knitting! Hey, I’ve been writing here for a whole year now. Full circle, in the cycle of knit, work, knit, ponder, knit, work, knit. I’m falling behind in my blog reading, and replying to comments, and in many of the little things and ways that are part of being a member of this community. I’ll get back on track one of these days. Everybody, it seems, says this, but it’s worth repeating: I’m really happy, and quite grateful that anyone reads my blog at all. That my world has widened so, and that I’ve begun so many wonderful friendships because of it, means everything to me. I’m a lucky, lucky knitter indeed. Happy Blogiversary!That scarf in incredible – you should be so proud. I’m am going to check into that pattern too! The scarf pattern is so beautiful. Thanks for posting it, I think I might just have to try it. Your blog is so lovely and very tranquil. Reading it makes me feel a little of both! So glad to have found you! Happy Anniversary! The yarn and the pattern go really well together. Happy Anniversary! Gorgeous! The post, the pic of the scarf, the fact that it blew off the windowsill while you were photographing it. And … happy anniversary! So glad you decided to enter the realm of this experiment in subcultural social history. 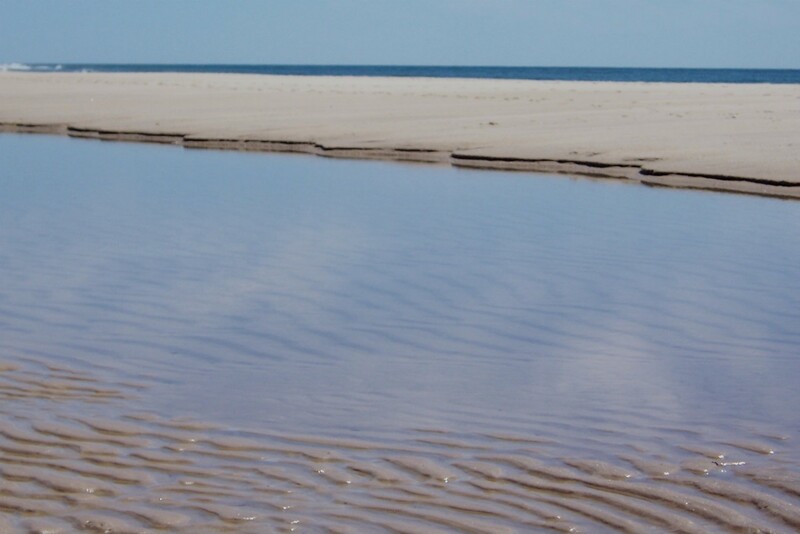 Reading, commenting, responding … just like everything else in life, there are ebbs and flows. Gosh you know this! You live next to the ocean, under the moon. Who cares if you keep up with your reading, as long as you keep writing. At least that’s what matters to me. Beautiful pattern choice for this yarn! 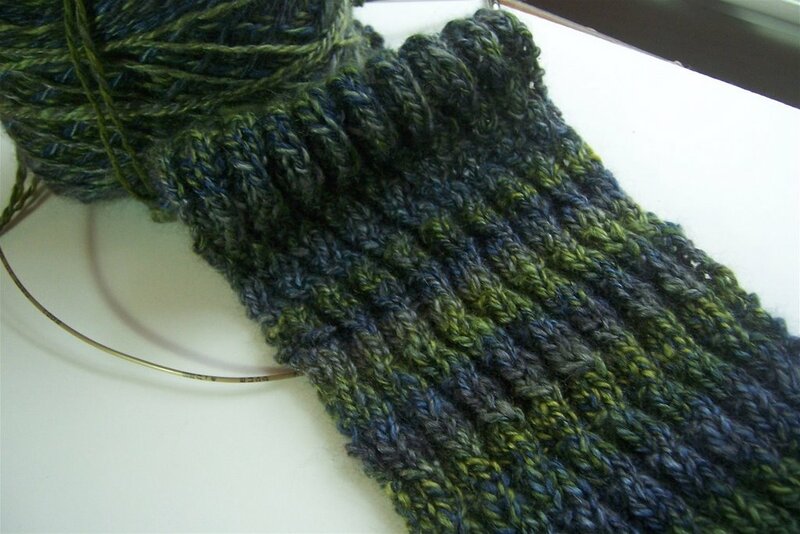 Great pattern for the yarn – and thanks for posting it!